The battle of Antietam, fought in and around the town of Sharpsburg, Maryland, on September 17, 1862 (less than sixty miles from Washington), ranks with a handful of other Civil War battles as such dramatic events as to almost seem like separate wars. In A Fierce Glory, Justin Martin tells its story for a general audience, avoiding "minutely detailed descriptions of troop movements." A Fierce Glory starts with John Mead Gould, one of the survivors of the battle who "ever remained in its thrall." Gould's years of correspondence with veterans Confederate and Union today provide a valuable resource on that tragic event. This study also relies on the work of "excessive battle chronicler" Ezra Ayers Carman, another survivor who never completely left the battle. Martin writes a book they would have liked. The author argues that this "battle was simply different from others: more heated, more savage, more consequential." Antietam became "over the course of a day--still the most lethal in American history." The battle "promised to open up a number of different routes" to Southern victory. The book includes "Antietam's legendary (and horrific sites)" including "the Cornfield, Bloody Lane, and Burnside Bridge" but also more. "As for the occasion for the Emancipation Proclamation," the author writes, "Antietam was a more critical battle than Gettysburg." Dr. Jonathan Letterman saved lives with "refining the three-tiered battlefield evacuation system--dressing station to field hospital to general hospital." A Fierce Glory offers spectacle over detail for the benefit of understanding. Martin mentions the supply trains and the "surgeons, blacksmiths, farriers, saddlers, weapon-repair specialists, commissary sergeants, couriers, and clerks" of the "two huge armies." To the soldier, however, "none of this colossal design was evident." They noted that the participants "were not merely men in blue versus men in gray." The soldiers saw the wide variations in uniforms and even regimental flags. Their number included American Indians, Hispanics, at least one Chinese, and least three African Americans. The reader could have benefitted from more detail, if not more accuracy, such as the differences in the artillery of the two respective armies. A "weapons repair specialist" is better understood as a gunsmith. Phrases such as perhaps eight women "also fought in the battle, dressed in drag in soldiers' uniforms" could stand rewording. A Fierce Glory has problems with focus, prose, and style. Many scholars would take issue with the subtitle's reference to and what Martin writes about the meaning of the Emancipation Proclamation and the importance of the battle to Abraham Lincoln. The author tells the story of Antietam from a Union perspective. Martin largely overlooks the almost insurmountable challenges that the Confederate army faced and the questionable decisions of its commander Robert E. Lee. 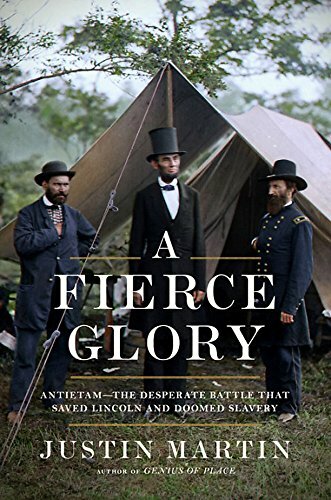 A Fierce Glory makes for an entertaining first book on the battle of Antietam/Sharpsburg, as background for any of the more extensive scholarship. It is annotated and includes the author's recommendations on places to visit connected with campaign.